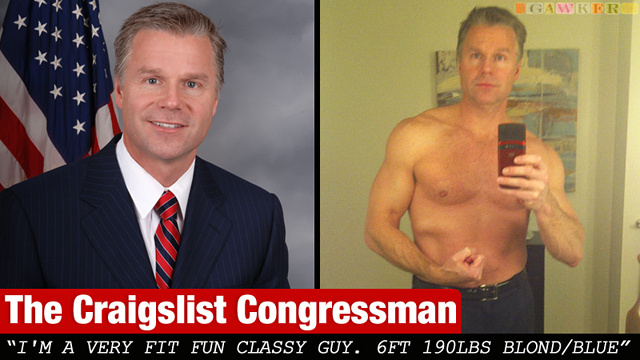 I thought this is very interesting - married Republican Chris Lee has announced his resignation from the House of Representatives after shirtless photographs that he had sent to a woman on Craigslist surfaced. Rep. Christopher Lee is a married Republican congressman serving the 26th District of New York. But when he trolls Craigslist's "Women Seeking Men" forum, he's Christopher Lee, "divorced" "lobbyist" and "fit fun classy guy." One object of his flirtation told us her story. On the morning of Friday, January 14, a single 34-year-old woman put an ad in the "Women for Men" section of Craigslist personals. "Will someone prove to me not all CL men look like toads?" she asked, inviting "financially & emotionally secure" men to reply. Lee cosponsored H. Con. Res. 274, reaffirming "In God We Trust" as the official motto of the United States and supporting and encouraging the public display of the national motto in all public buildings, public schools, and other government institutions - the official motto of the United States and supporting and encouraging the public display of the national motto in all public buildings, public schools, and other government institutions - Thats My Congress points out that Lee's legislation would essentially violate the constitution by legitimizing one faith over another. The United States Constitution is very clear when it comes to the role of religion in American politics. Religion is only mentioned twice in the Constitution, each time forbidding government from using its powers for purposes of religious imposition: "no religious Test shall ever be required as a Qualification to any Office or public Trust under the United States," goes the first constitutional declaration, and "Congress shall make no law respecting an establishment of religion," goes the second constitutional declaration. But with the introduction of H.Con. Res 274, some members of Congress are attempting to make a law respecting an establishment of religion. If passed, the bill would make it a declaration of Congress that "it is Religion and Morality alone, which can establish the Principles upon which Freedom can securely stand," and would "encourage the public display" of the phrase "In God We Trust" in every public building and in every public school. As any student of comparative religion knows, the monotheistic figure God is a particular feature of Abrahamic religion, incompatible with dozens of religious traditions from around the globe including Native American religious tradition, and also incompatible with the religious viewpoint of millions of secular, agnostic and atheist Americans. H.Con. Res 274 is a direct challenge to the First Amendment of the Constitution. Those who support the bill are brazenly sidestepping the Constitution, using government power to establish one religion in all government buildings, one religion in all public schools, one religion over others and over none. Lee also voted against H.R. 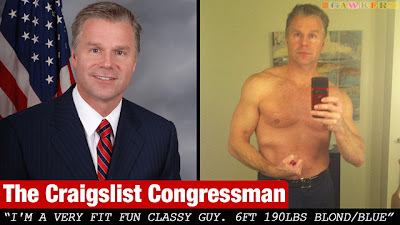 2965, or The Don’t Ask, Don’t Tell Repeal Act of 2010, indicating that he believes homosexuals to be second class citizens, who cannot serve openly in the military (or get married), but Lee can send shirtless pictures of himself to women online and make a mockery of his wedding vows if he likes. Lee promoted himself as a family man in his campaign ads, featuring an image of himself with his wife and child - not his shirtless body and his Craigslist prospects. Funny coincidence: the Captcha word for my previous comment was "exual". Ooops. So much for family values. Typical hypocritical behavior of a Republicant.